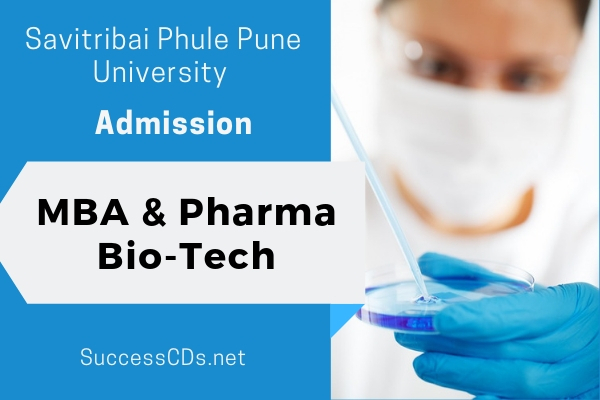 Savitribai Phule Pune University MBA (Pharma-Biotechnology) Admission 2019 - Department of Management Studies, Savitribai Phule Pune University, has invited applications for admission to the MBA (Pharma Biotechnology) offered it for year 2019 – 20. The Department of Management Sciences, fondly known as PUMBA is one of the distinguished Post-Graduate Departments of the Savitribai Phule Pune University. It provides quality education to the students keeping them abreast with the dynamic corporate world. MBA – Biotechnology, program has been pioneered by PUMBA in order to develop managerial manpower in the fields of Bio-Pharma, Bio-Agri, Bio-Suppliers, Bio-Informatics, Bio-Services and Healthcare. The course structure has been designed to suit the requirements of this sector. Stage 1: Entrance test-- ATMA Test conducted by AIMS on December 23, 2018, February 17, 2019, or May 26, 2019. Applications regarding grievances / objections regarding merit list will be accepted in the department till: 2 pm on July 2, 2019. *Final Merit / Allotment list for admissions will be displayed on the PUMBA website on July 3, 2019 at 5 pm.